Finally we’re getting the rest of the open shelving added to the kitchen! I’ve been talking about it since before Christmas and here it is April, almost 5 months later. Better late than never and no harm was done except that my nerves were getting frazzled because I was running out of space to store my white ironstone finds. If you’ve been reading my previous kitchen posts, you’ll remember that we didn’t have anything on this wall at all. I’ve had a chalkboard on this wall and at one point hung a small, antique cabinet but they just did’t seem to fit this space. At first I considered placing 2 shelves on this wall but realized there wasn’t enough space above the bead board, plus it would feel claustrophobic and heavy. I had some pre-made shelves I bought on a whim to use where ever, and thought they might fit here, but the size wasn’t quite right. So off to Lowe’s we went. We ended up buying two 8-foot plain pine boards at $10 each and had the Saw Guy at Lowe’s cut them down to 65 inches. We also purchased simple white brackets with curlicues. The brackets came in a pack of 2 for $10. I painted the shelves with the same paint I used on the bead board … an ultra white kitchen cabinet paint. I was happily surprised to find the boards only needed one coat of paint! As soon as hubby finished hanging the first shelf, I got busy playing with some of my ironstone collection. I absolutely adore this ironstone bowl I bought at the Geneva Antique Market for $24. I love its imperfections. 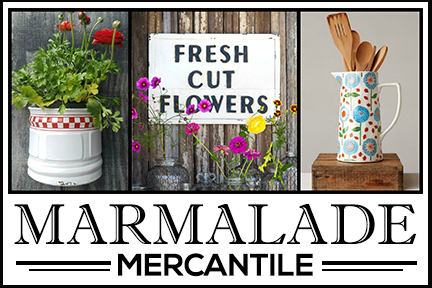 The daffodils are in full bloom outside, so I picked a bouquet and stuffed them in my enamel pitcher. A little white mirror adds a bit of whimsy and reflects the wonderful light that streams in the trio of windows above the kitchen sink. I love the simplicity of this shelf. It’s understated so the ironstone is able to take center stage. Hubby hung the second shelf on the other side of the kitchen and it was immediately primped with more ironstone. Total cost for both shelves was a mere $50. We used 3 brackets on each shelf instead of two, partly for added support and also because I think it looks better. Decorators always say to group things in odd numbers! 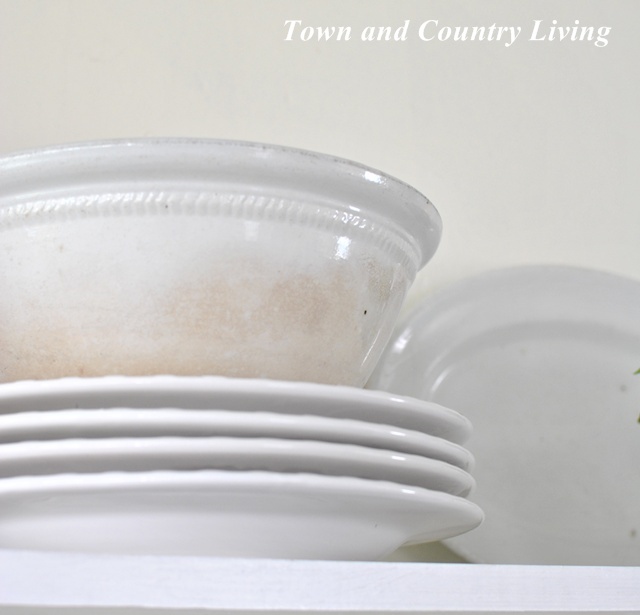 Your ironstone pieces look so pretty on your new shelf. Great way to enjoy and handy to use your nice collection. It’s perfect and I love all your ironstone. I absolutely love your kitchen, and these cabinets are perfect! My kitchen is yellow too and I couldn’t imagine it being a different color. 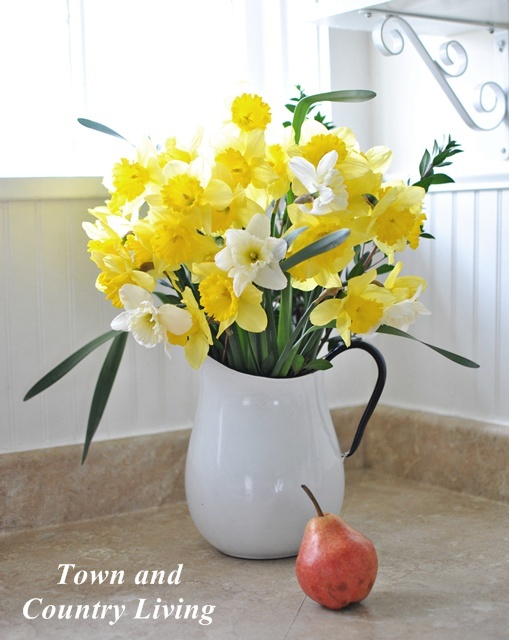 There is something so crisp and clean about yellow and white in the kitchen or bathroom. Love your shelves…..great budget friendly way about it too! How beautiful! The shelf is perfect; and I love the mix of ironstone and wood. What an awesome kitchen you have – so light and airy. The shelf is perfect for this space, and I like the three supports instead of just two. LOVE IT! 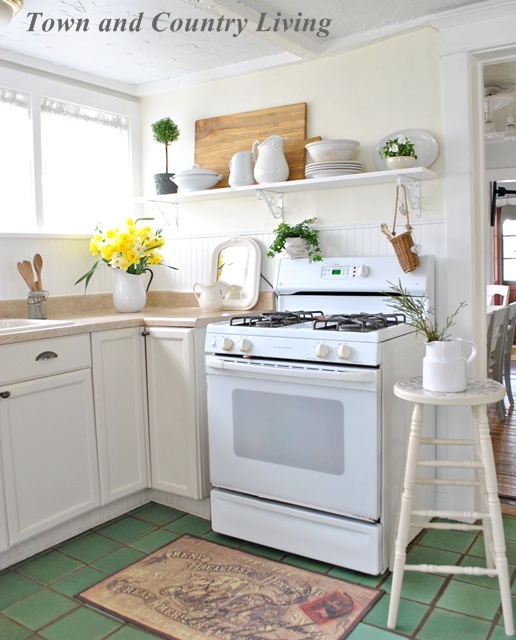 This is the perfect cottage kitchen! How delightful and warm and cozy! The addition of your shelf gives you a space to fill with fabulous finds and I see you did!!! The little hanging basket is so adorable! What a lovely welcoming kitchen! It looks so nice. I have a similar place above my stove I have been going back and forth with, whether or not to put a shelf or 2 there. Now that I see what it will look like, I think I’ll go for it. Oh my goodness…you mean you had an empty wall??!! 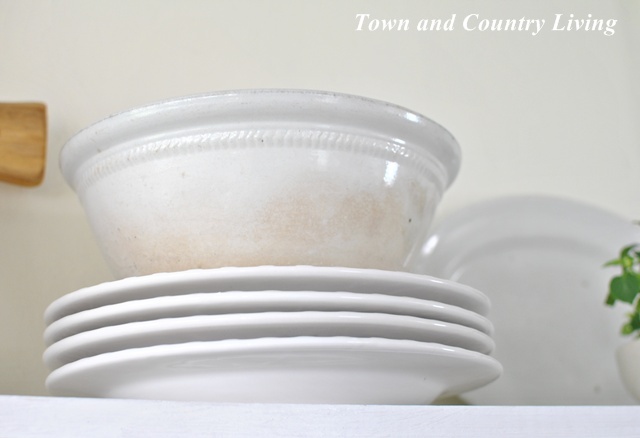 I love the shelf with all the always lovely white ironstone, it’s great!! Wish I had an empty wall to do that, but me, everything is taken!!!! Have a great week. Love the new shelf….its perfect and needs the 3 brackets for the weight of the ironstone. Its always cheaper when you construct yourself instead of pre made shelves. No empty walls here either!!!! 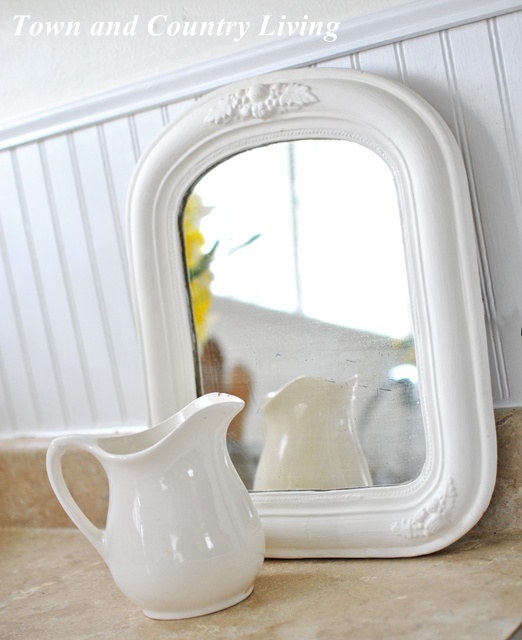 this is a wonderful addition, and such a pretty way to show off all your great ironstone. LOVE that white bowl. I’ve been looking for them myself. I have one that needs some friends! I love your open shelving The ironstone looks beautiful on your shelves. Your kitchen is so bright and beautiful. the shelf and ironstone looks so pretty, jennifer:) adorable little mirror, too–have a great week! I love open shelves in kitchens that you can change around whenever you like. This one looks so perfect Jennifer. Very pretty, Jennifer! I love the brackets you chose, too. Your open shelving is lovely Jennifer, and the fresh flowers and little mirror make it even more fabulous. Have a great week! I am a huge fan of white kitchens, and white jugs, enamel wear and dishes! We have moved to a new house and completed our kitchen reno…I am always looking for ideas on how to display my white jug collection. 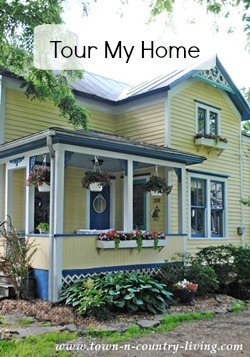 Love your home,,,,I am your newest follower! Have a great week! You can scratch that project off the list now. More shelves is always a good thing, so I say yes to some for the bathroom. Love the shelf and the ironstone. I think one shelf is plenty there… Keeps it open and airy. Very pretty! Jen…this is perfect! So sunny and open and airy! 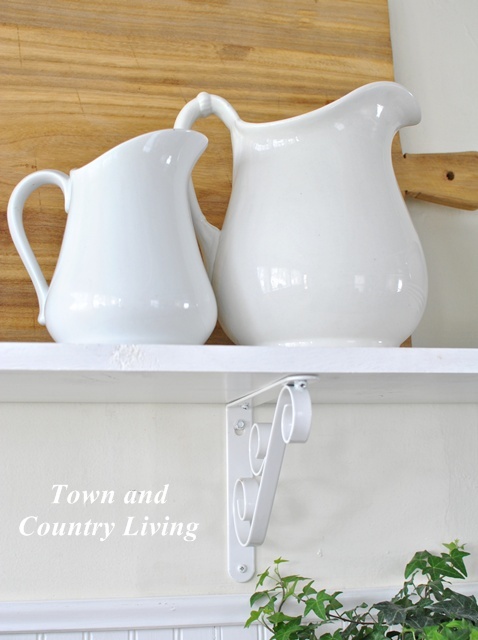 I love the pretty brackets you used and the ironstone looks perfect. I have open shelves at the lakehouse and it’s really fun to change things around on a whim! What a great idea using bead board behind the stove. I love that Lowes and Home Depot will cut your wood for you. I’m still waiting for hubs to hang two shelves in my bathroom that I just bought at HD. Enjoy this great weather, I don’t know if my daffs are too far gone to cut and bring in, they bloomed during all that rain we had. 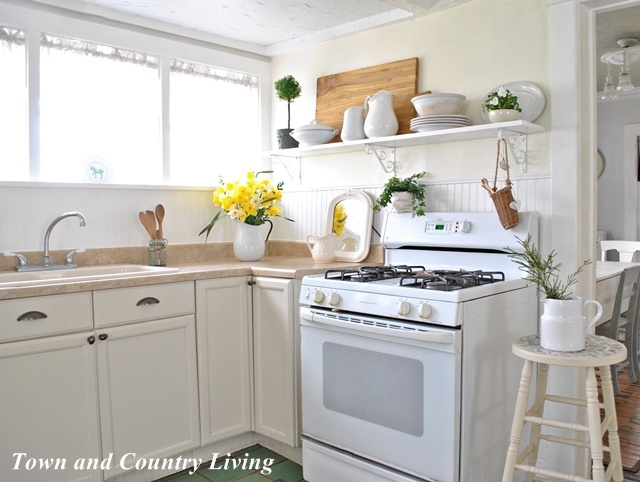 Jennifer, this looks perfect and I love the ironstone, That picher with the daffodils, which are my favorite, is bright and cheery and adds such pep…..love the rug in front of the oven. Jennifer! I love the open shelving and the way you have it decorated is beautiful. I love the look of open shelving in a kitchen, and yours looks so pretty, especially with your ironstone displayed on it. Your shelf is the perfect touch for your kitchen. Looks like it was meant to be there. Your new open shelving looks fabulous, Jennifer! You two did a really nice job and the brackets finish them perfectly. So pretty with your things arranged on the one pictured! 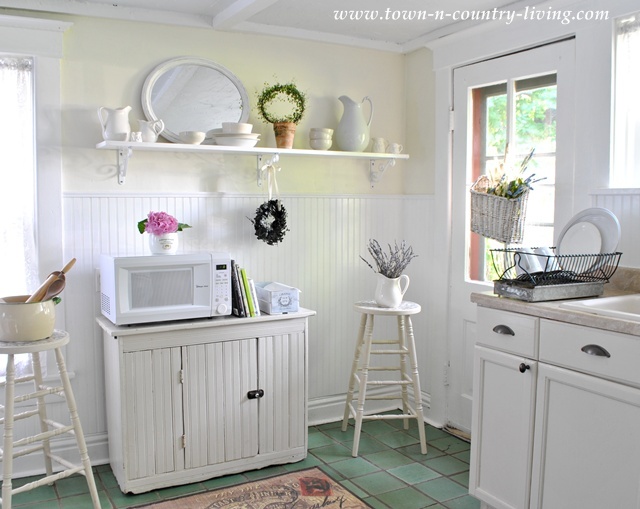 Your kitchen it truly an example of cottage charm! 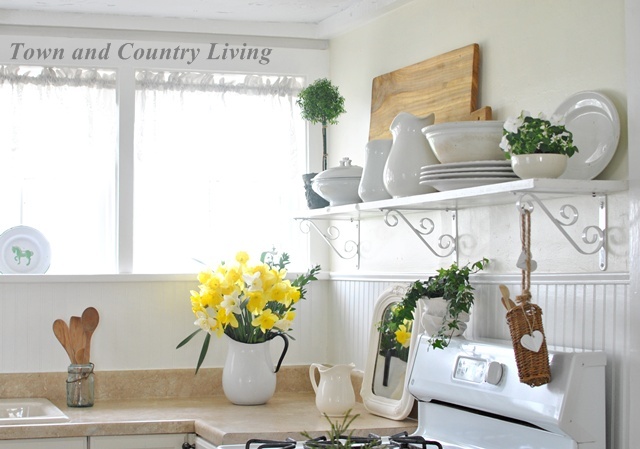 The white wainscoting, ironstone and curlicue bracketed shelves accented by softly sunlit daffodils are all so warm and welcoming. And, done on a budget! Thanks for sharing! 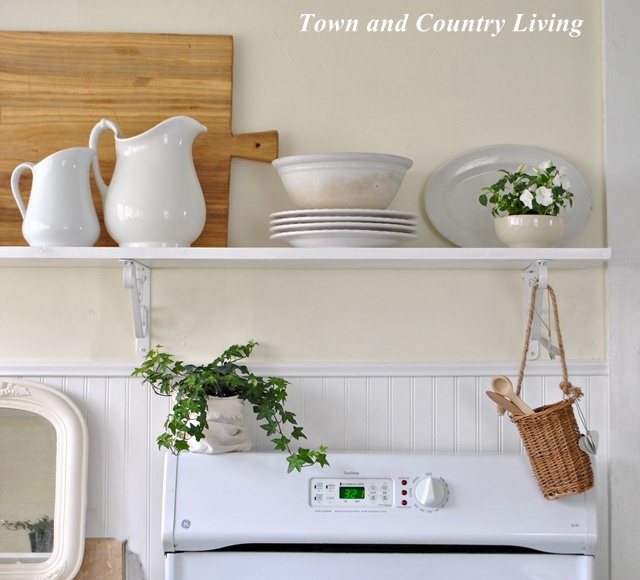 The shelf is such a perfect addition to your country kitchen. I really like the brackets! Darlin’, this is absolutely awesome. I so love your shelf and the things you have on it. We have never bought expensive shelving, either….we do just as you did. Oh it is just gorgeous!!!! I love how your shelves turned out!! Your kitchen looks so bright and fresh! This looks so beautiful and inviting. I love the imperfections on the bowl as well. I love a home cottage look. It is classy yet comfortable. Thanks for the inspiration. 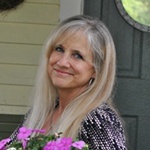 I will be following you on bloglovin’! Love, love, love your kitchen. The open shelf is wonderful and you have it styled so beautifully. I love the small topiary you added too. The greenery and flowers just finish off everything so beautifully. I would love for you to also link this to my party. Love the shelving and the pretty display!! 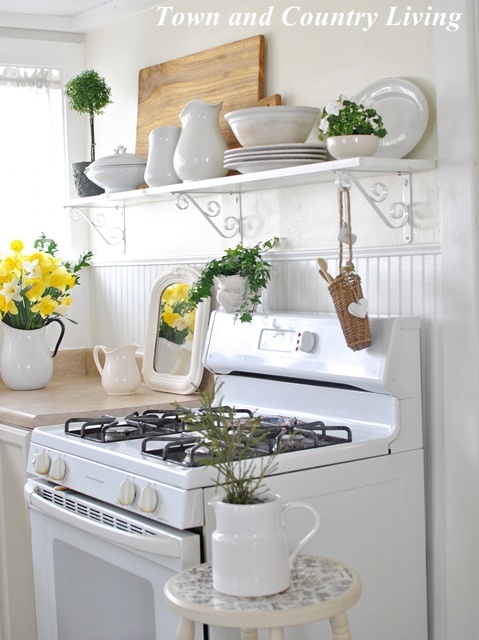 Love the charming vignette on your kitchen shelf! It looks beautiful!! I love open shelving in a kitchen – you and your hubby did a great job! Love all your Ironstone, too. Did there used to be cabinets on that wall? You will come up with a fabulous idea for the unused shelves.Open shelving in your kitchen is perfect for your collection. You have done such a lovely job on these shelves… I have been collecting white ironstone for many years and I still get a bit giddy when I see it! You made me smile today!! love the look of your kitchen! It’s so cozy looking. The combination of ironstone and the wood of the cutting board is simply stunning! I just always love everything you do. Your home is so warm… light and bright. Happy too. It just looks “happy”. Always. The new shelves are styled so cute and the little swirls are perfect for hanging goodies from! Very clean and fresh!! Beautifully decorated with the ironstone. I love open shelves! What a perfect way to showcase your beautiful ironstone collection! Gorgeous. They look so natural there! 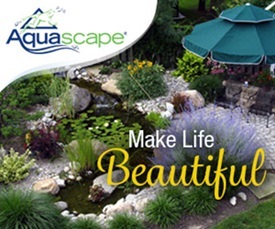 Great job, and I love your ironstone…..
Beautiful! I love open cabinets! What is the wall color above your white beadboarc?